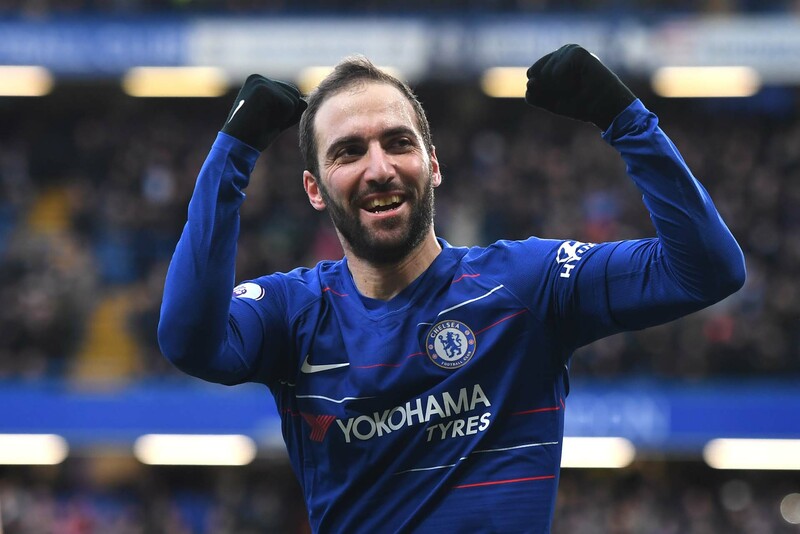 Gonzalo Higuain of Chelsea celebrates after scoring his team's first goal during the Premier League match between Chelsea FC and Huddersfield Town at Stamford Bridge on February 2, 2019 in London. Chelsea bounced back after defeat at Bournemouth in the week with a resounding 5-0 win at home to Huddersfield. Alonso returned to the starting line up at left back, whilst Christensen started alongside Luiz. Barkley also started in the midfield three, with Willian and Hazard flanking Higuain. Chelsea controlled the ball from the start. Initially struggling to create, but grew into the match as it went on. A lot of the play was sideways to begin with as we lacked penetration. This changed as Hazard and Higuain showed more promising signs of a developing relationship with some good link up play. Barkley fired a warning shot across the bows of the Huddersfield goal from range early on, and there was to be only one side that realistically looked like scoring as time went on. Most of our creative influence was coming from two areas. The first, the link up between Hazard and Higuain. Hazard was finding space between the lines and playing some nice one –two’s with our new forward. One such move resulted in Hazard firing towards goal but the shot was deflected wide. Higuain was next to have a scoring chance, this time created by a nicely lofted ball over the visiting back line by Jorginho. His right foot volley on the turn was blocked for a corner. The second area that was proving fruitful for us was wide, particularly down the right, thanks to nice work by Willian, and in particular the overlapping Cesar Azpilicueta. It was one such foray down the right by Azpilicueta that created the opener. He cut a pass back to Kante on the right corner of the box. He brilliantly picked out Higuain with an outside of the foot through ball that split the Huddersfield defence. Higuain despatched with some gusto at the near post. His first Chelsea goal. On more than one occasion the overlapping runs of Azpilicueta were not tracked, and he found space to drive a shot at goal from 20 yards out, but it was well turned away by Lossl. It was the other full back who created the next chance. Alonso whipped a low cross in from the left, which Higuain came onto and hit first time into the side netting at the near post. As Alonso was now getting forward regularly, Diakhaby on the right wing was found on a few occasions with space to run into behind the Spanish full back. He looked a danger when running at our back line. He couldn’t make anything happen from these opportunities though. He did on one occasion manage to cut the ball back to Billing, but Christensen made a good block from his effort. Chelsea doubled their lead before the break, again thanks to the tireless Azpilicueta. As the ball was worked wide, his opposite number had failed to track his run. As Kachunga raced back to try to make a challenge, he pushed Azpi over. The ref judged it to have been in the box, although subsequent replays showed the first contact to have been just outside. Hazard didn’t mess about with the spot kick. Blasting it to Lossl’s right. Chelsea didn’t relent in the second half as a similar storyline played out. With all the ball, and with renewed confidence, we looked much more dangerous around the box. Willian cut in from the right and fired just over early on. It was the link play between Hazard and Higuain that was the biggest positive to take away though. Both players taking turns to drift in behind the Huddersfield midfield to receive the ball, and move it quickly onto their counter part. It was the Belgian who made it three, assisted on this occasion by Ross Barkley with a nice through ball finding Hazard racing into the area down the left hand side. He rounded Lossl and tucked away his second of the match. Huddersfield’s confidence was shot after this. They sat off and retreated deeper in midfield. Neither of which helped them at all. The fourth goal of the afternoon was the pick of the bunch. Hazard laid into Kante on the edge of the area, he touched it back to Higuain who curled a fantastic right-footed effort first time that sailed over the keep and into the far top corner. Exactly the sort of thing we had hoped to see from the Argentinean. A nice corner routine saw Luiz step over the low ball to the edge of the area, and Kovacic met it first time behind him, but it was blocked well. Another corner resulted in another goal. Luiz unmarked headed goal wards, the ball was then diverted past his on keeper by Kachunga. A resounding win for Chelsea, and some positive improvements compared to midweek. Lets see if these can be taken forward into our upcoming league fixtures against Manchester City and Tottenham. Willian, Higuain, Hazard, (Hudson-Odoi 77).